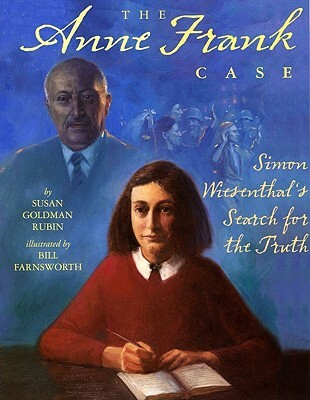 Determined to find definitive proof that Anne Frank's diary was authentic, Simon Wiesenthal began a five-year-long search for the Gestapo officer who arrested the Frank family. This inspiring and suspenseful account testifies to the difference that one person's dedication can make. Susan Goldman Rubin is the author of more than fifty-five books for children. She has written extensively on human rights in books such as Fireflies in the Dark: the Story of Friedl Dicker-Brandeis and the Children of Terezin, which was a Sydney Taylor Award Honor Book and a SCBWI Golden Kite Honor Book, and Freedom Summer: The 1964 Struggle for Civil Rights in Mississippi, which was an ALA Notable Book, a Booklist Editors' Choice and A Golden Kite Honor Book. Many of her books focus on the arts, with an emphasis on the visual arts. She lives in Malibu, California. Bill Farnsworth’s illustrations for The Flag with Fifty-six Stars: A Gift from the Survivors of Mauthausen by Susan Goldman Rubin were called "nothing short of extraordinary" by PW in a starred review. He lives in Florida.